We’d love your help. Let us know what’s wrong with this preview of Superfans by George Dohrmann. A Pulitzer Prize-winning journalist pulls back the curtain on the extraordinary inner lives of America's most obsessive sports fans. There are fans, and then there are fanatics. In this wondrously immersive look at American sports fandom, George Dohrmann travels the country to find out what distinguishes an ordinary, everyday enthusiast from that special breed of supporter A Pulitzer Prize-winning journalist pulls back the curtain on the extraordinary inner lives of America's most obsessive sports fans. There are fans, and then there are fanatics. In this wondrously immersive look at American sports fandom, George Dohrmann travels the country to find out what distinguishes an ordinary, everyday enthusiast from that special breed of supporter known as the superfan. In Minnesota, Dohrmann meets newly minted generals of the Viking World Order, a Minnesota Vikings affinity group organized along military lines. In Oregon, he shares a few beers with a determined soccer fan who amassed--almost singlehandedly--a four-thousand-strong cheering section for the fledgling Portland Timbers. In Illinois, he talks with the parents of a five-year-old boy whose intense hatred of Tom Brady went viral on YouTube. Through these and other intimate profiles, Dohrmann shows us the human faces behind the colored face paint, the real people inside the elaborate costumes who prowl the stands and parking lots at stadiums from coast to coast. In addition to the fans themselves, Dohrmann also talks with the experts who study them. He uses the latest thinking in sports psychology--some of it learned during a spirited round of miniature golf with a group of professors at the annual Sports Psychology Forum--to unravel the answers to such burning questions as: How does fandom begin? What are its effects on everyday life? When does it go too far? For everyone who's ever body-painted their torso with the team colors of their alma mater before heading off to a sports bar--or even just screamed at their television during the NBA Finals--Superfans offers an entertaining and insightful exploration of the many ways human beings find meaning in something bigger than themselves. To ask other readers questions about Superfans, please sign up. I really enjoyed this book on some of the most dedicated, die-hard fans of various teams, mostly in football, but soccer and baseball were also covered. In every case, not only were the people profiled, but there were studies done on what made these people do what they did. It's good for those who want to study the brains and though processes of these individuals, as there is more of this type of dialogue in the book than there is sports coverage. We've all probably witnessed fan behavior at some point that leaves us shaking our heads. In Superfans, Dohrmann examines the psychology behind behavior that to the casual observer is at best questionable. He shows us both the beauty and darkness that can result from what may seem to some as an obsession. For me, part of the fun of reading Superfans is that this was a topic I didn't even realize I was interested in prior to reading. Dohrmann relies pretty heavily on Psychology professor Dan Wann, We've all probably witnessed fan behavior at some point that leaves us shaking our heads. In Superfans, Dohrmann examines the psychology behind behavior that to the casual observer is at best questionable. He shows us both the beauty and darkness that can result from what may seem to some as an obsession. For me, part of the fun of reading Superfans is that this was a topic I didn't even realize I was interested in prior to reading. Dohrmann relies pretty heavily on Psychology professor Dan Wann, whose research focuses on team identification. Wann is quoted describing how a few weeks into one of his college courses, "[t]he class suddenly shifts from a gym class to a science class." Each chapter of Superfans attempts to do just this - detail an intriguing story of sports fandom and provide a scientific explanation for it, no matter how ridiculous it may seem on the surface. Picturing a man donned in a banana costume going through a whirlwind of emotions as he discovers that another fan has stolen his idea is hilarious on its own, but when Dohrmann uses the anecdote as a way to examine optimal distinctiveness vs. assimilation, he provides a platform for understanding what oftentimes seems like unexplainable fan behavior. This book was such a fun read. I don't know that I really learned anything, but it sure was interesting. 60% of Americans identify as sports fans, and if you're reading this review you probably count yourself among the ranks of athletic partisans. Originally inspired by his experiences fielding calls from irate readers while working the sports desk at The Los Angeles Times at the start of his journalistic career, sportswriter George Dohrmann explores the most extreme depths of fandom in his new book Superfans and details the psychology behind such behavior. It is not as gripping or powerful as his 60% of Americans identify as sports fans, and if you're reading this review you probably count yourself among the ranks of athletic partisans. 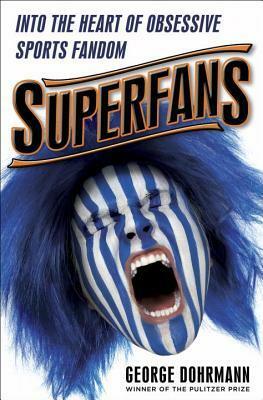 Originally inspired by his experiences fielding calls from irate readers while working the sports desk at The Los Angeles Times at the start of his journalistic career, sportswriter George Dohrmann explores the most extreme depths of fandom in his new book Superfans and details the psychology behind such behavior. It is not as gripping or powerful as his absolutely fantastic Play Their Hearts Out but Superfans is a breezy and enjoyable application of pop psychology to the sporting realm. I don't watch or have any interest in sports, but the way this book describes different types of fanatics is still really interesting, maybe more than it would be if I was a fan myself since I don't see myself in any of the descriptions of the troubling aspects of fandom. Each chapter deals with a different facet of what it means to be a fan and how people express their fandom, usually by telling the story of a fan who embodies the chapter's focus. Some are inspiring, like the soccer fan who mad I don't watch or have any interest in sports, but the way this book describes different types of fanatics is still really interesting, maybe more than it would be if I was a fan myself since I don't see myself in any of the descriptions of the troubling aspects of fandom. Each chapter deals with a different facet of what it means to be a fan and how people express their fandom, usually by telling the story of a fan who embodies the chapter's focus. Some are inspiring, like the soccer fan who made it his mission to get his relatively unpopular sport shown at local bars or the mascot who recovered from the death of his young daughter with help from the fan group he belonged to, or entertaining, like fans who make elaborate costumes to showcase their loyalty or pull ridiculous stunts like printing out gigantic celebrity heads that are used to taunt players on opposing teams. Other chapters get into the darker side of superfandom, like one that chronicles the abuse sports journalist receive when publishing news that paints a franchise in a bad light. Though the book is mostly character studies some chapters get into the psychology behind fandom. My favorite contrasts two fans' reactions to their team drafting a player who had been accused of domestic abuse. A women who was formally abused herself sticks with the team and urges others to give the player a fair shake, while a man who runs a forum dedicated to the team shuts it down and stops following the sport. Dohrmann makes the case that while both of them love the team, the man has an easier time leaving them since he has a family and other hobbies while the woman does not have that kind of support outside her sports-related social life. The concept of "optimum distinctiveness" is brought up a few times to explain why fans are celebrated for wearing face paint but ostracized for fighting with fan of other teams. Fans want to express themselves but have to straddle the line between creative passion and obsession. Another great chapter centers around children's relationship with sports. I was surprised that the author is firmly against children being fans of specific teams. Through various studies and interviews with behavior experts he explains that kids have a very black-and-white worldview and are quick to categorize people as good or bad with no in-between. Teaching young kids that players on the family's favored team are the "good guys" can lead to them feeling genuine hatred towards players and fans of other teams, and to have dramatic emotional reaction to wins and losses. Instead of appreciating the game itself they get the idea they're watching a struggle between good and evil. George Dohrmann's "Superfans" is a study of how meaningful sports, and favorite sports teams, can become in the lives of their fans. Some people identify so closely with their favorite team that their whole lives seem to revolve around the ups and downs of those teams' competitive seasons. Others are more casual fans or bandwagon fans who come and go largely depending on the won-loss records of their local teams (or teams with which they have some other kind of tie: an old school or childhood me George Dohrmann's "Superfans" is a study of how meaningful sports, and favorite sports teams, can become in the lives of their fans. Some people identify so closely with their favorite team that their whole lives seem to revolve around the ups and downs of those teams' competitive seasons. Others are more casual fans or bandwagon fans who come and go largely depending on the won-loss records of their local teams (or teams with which they have some other kind of tie: an old school or childhood memory, for instance). "Superfans" tries to answer why some fans take it all a whole lot more seriously than others. Anyone who has ever attended a professional sporting event probably has seen one of Dohrmann's "superfans" more than once, those who arrive at the venue covered in team-colored war paint, wigs, and costumes that leave little doubt as to their level of loyalty to the home team. Dohrmann has chapters on specific fans who have detrimentally let it take over their lives to fans who have greatly benefited from their close identification with a team. I was especially touched by the chapter titled "Salvation Army" that profiles Jim Serrill, a man who became closely associated with the Portland Timbers soccer club, so closely, in fact, that when Serrill's daughter died in a tragic auto accident, it was the team that largely brought him back from the brink of despair. Another memorable chapter called "Breaking Away" describes the process of what happens when rabid fans lose interest in their favorite team or, more likely, in their favorite sport and how difficult it is for them to finally let go. This is something that I suspect is probably happening all across the country these days with NFL fans who are finally growing fed up with professional football's politicalization and concussion problems. I really enjoyed this book, especially the way the author chose to bookend it with stories of the Timbers: Nevets and Timber Jim and how one man can create a literal army in Timbers Army. This was an interesting combination of sociological research into fandom and anecdata in which the author conducted some really interesting one on one interviews. I thought the intersections of religion and medical addiction with sports drew an interesting parallel. The Vikings fan could walk away from the Vikin I really enjoyed this book, especially the way the author chose to bookend it with stories of the Timbers: Nevets and Timber Jim and how one man can create a literal army in Timbers Army. This was an interesting combination of sociological research into fandom and anecdata in which the author conducted some really interesting one on one interviews. Book-ended with stories about fans of the MLS Portland Timbers (one sweet and joyful, one very, very moving), this smart, breezy book looks at some extreme American sports fans and investigates the roots, goals, costs and benefits of their obsessive fandom. Threaded throughout the book is the research of a jolly group of sports psychologists and sociologists (we meet them playing mini-golf the night before an academic conference), whose scholarship illuminates the people and behavior Dohrmann wr Book-ended with stories about fans of the MLS Portland Timbers (one sweet and joyful, one very, very moving), this smart, breezy book looks at some extreme American sports fans and investigates the roots, goals, costs and benefits of their obsessive fandom. Threaded throughout the book is the research of a jolly group of sports psychologists and sociologists (we meet them playing mini-golf the night before an academic conference), whose scholarship illuminates the people and behavior Dohrmann writes about. Dohrmann treats his subjects with honest warmth and compassion where other writers might see them as easy punchlines, and he uses a masterful balance of academic research and his easy journalistic ability to show that these face-painting, costume-wearing, remote-throwing obsessives are, by and large, happier than non-sports fans. Enjoyable, illuminating, and a very snappy read, with moments of both genuine hilarity and great, moving emotion, this was a much better book than I expected from its horrible, horrible cover. I was lucky and won a copy of this book from Goodreads Giveaways. I wasn't sure what to expect from this book and was worried it would just be fluff about the silly and outrageous things some fans do to show their love for their team. While there were some very interesting profiles of "super fans" - ie the guy who painted his house team colors, people with team tattoos, a man who wears elaborate costumes to every game, etc - it was much more about WHY people are fans. The psychology behind fando I was lucky and won a copy of this book from Goodreads Giveaways. The psychology behind fandom is seldom thought about and is a very intriguing topic. How do people start being fans? Why do some people evolve into consumed superfans? Is all this healthy and worthwhile? You'll find the answers in this well written and accessible book, and you don't have to be sports obsessed to enjoy it. I suspect the current cover art may be doing this book a disservice. I expected this to be a straightforward description of the wacky things sports fans do in support of their teams. It is more nuanced an in-depth look at the sociological and psychological aspects of fandom. Along with some wacky things. For me personally, one of the things that made this book interesting was considering the parallels between sports fandom and political identification. I found the book to be well written. The sty I suspect the current cover art may be doing this book a disservice. I expected this to be a straightforward description of the wacky things sports fans do in support of their teams. It is more nuanced an in-depth look at the sociological and psychological aspects of fandom. Along with some wacky things. For me personally, one of the things that made this book interesting was considering the parallels between sports fandom and political identification. I found the book to be well written. The style was not too informal, but not too academic either. I was browsing at the library one day (something I rarely do) when I saw this book on a shelf. "Hey, I'm a big sports fan. I bet I'll like this," I thought to myself. Imagine my surprise when I began to flip through it and the first picture I saw was of someone I've met before. That's when I realized that a large portion of the book happens to be about the fandom that I belong to, including what is probably our most poignant story (an event that I was part of). So I knew I was going to like this I was browsing at the library one day (something I rarely do) when I saw this book on a shelf. "Hey, I'm a big sports fan. I bet I'll like this," I thought to myself. Imagine my surprise when I began to flip through it and the first picture I saw was of someone I've met before. That's when I realized that a large portion of the book happens to be about the fandom that I belong to, including what is probably our most poignant story (an event that I was part of). I received an ARC of this book via NetGalley in exchange for my honest opinion. A fantastic exploration on what comprises the mental and social makeup of a fan. Do not forget than fan is short for fanatic, which, by definition, tends to focus on the extreme aspect of a fan's dedication and admiration for a team. Dohrmann does a great job of looking at the positive and negative traits exhibited by a fan. By exploring fans that would be considered "normal" as well as "extreme", Dohrmann was able t I received an ARC of this book via NetGalley in exchange for my honest opinion. George Dohrmann deftly mixes academic and anecdotal research in this book about what drives sports fans. He covers the insanely-dressed fans you see on TV and college professors who seek to grasp the psychology of fandom. In doing so, Dohrmann unearths reasons both obvious and insightful, and tells very good stories along the way. Sports fans will enjoy the easy read, and they’ll better understand their own fandom after reading it. It began with soccer, talked about a church in Texas where the Cowboys are integrated into the service and the Kevin Durant betrayal of the OKC Thunder and ended with soccer, so I pretty much self-identified with a lot of it. Recommend for anyone that calls themselves a fan of any sport. A really nicely balanced overview of the positives and negatives of being a sports fan. I largely gave it up after Bartman, but there are some really nice passages about the community sports engenders. If you ever wondered why fanatical sports fans are they way they are, this book is for you. It is very enlightening and gives an understanding of these fans. Thanks to Goodreads First Reads for a copy of Superfine: Into the Heart of Obsessive Sports Fandom. Mildly interesting. Those people are crazy. George Anderson Dohrmann (born February 14, 1973), is a contributing writer for Sports Illustrated, the 2000 Pulitzer Prize winner for beat reporting, and author of Play Their Hearts Out, which received the 2011 PEN/ESPN Award for Literary Sports Writing.